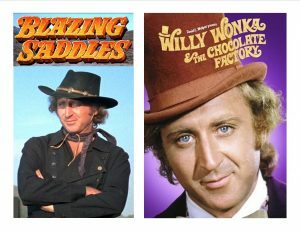 It’s National Art-House Theater Day on September 24th, and we thought that was a perfect time to celebrate and honor the work of the great Gene Wilder, by presenting two of his greatest roles. Please join us for this amazing opportunity to see these great works on the big screen once again, and share them with a new generation. As if that weren’t enough, we’re throwing a WILLY WONKA PARTY on Saturday the 24th, from Noon until 4pm, complete with chocolate fountains, a cotton candy machine, scrumdiddilyumptious amazing prizes for anyone who comes in Wonka-style costumes, and best of all…5 LUCKY CUSTOMERS WILL WIN A GOLDEN TICKET GOOD FOR FREE MOVIES FOR A YEAR, OR A THREE-HOUR THEATER RENTAL! !